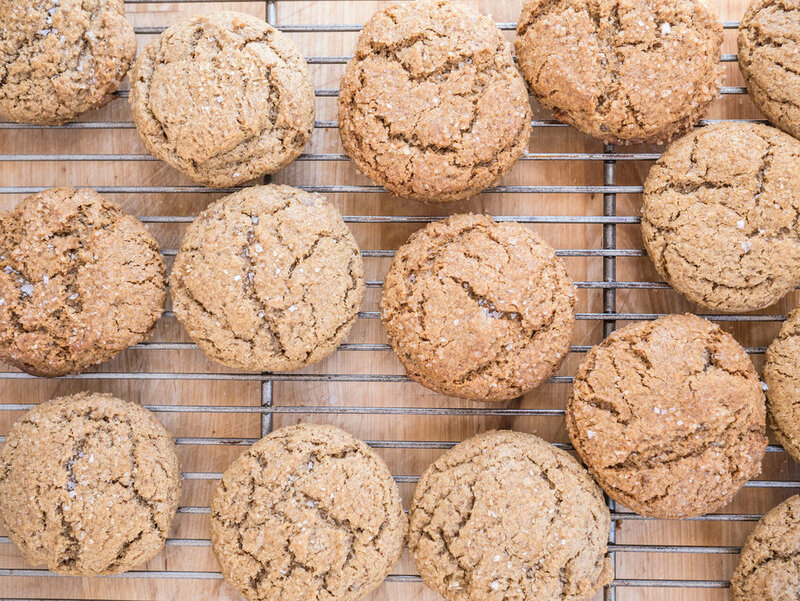 These cookies are inspired by one of my favorite local haunts, Bartavelle and their delicious ginger cookies. They are a comfort food for me and I was craving something spicy and really chewy. So I decided to make my own. This cookie is dense and soft and spicy and sweet. Full disclosure, I ate two in a row hot out of the oven. Consider me comforted! Preheat oven to 350 degrees. Melt butter and set aside to cool. Combine flour, sugar, spices, salt, baking soda and candied ginger in a mixing bowl. If you don't have rye flour, you can use 100% AP flour. In a separate bowl, whisk together melted butter, egg, molasses, vanilla and brown rice syrup. Slowly combine the wet ingredients with the dry until they are fully mixed (you don't have to worry about "overmixing" this dough). Once combined, scoop into balls, roll in turbinado sugar and place on a cookie sheet lined with parchment paper or silpat. Bake for 10 minutes or just util the bottoms start to brown. Let cool for 2 minutes on the cookie sheet before moving to a wire rack.